These Rudolph Peanut Butter Cookies are a crowd favorite during the holidays! 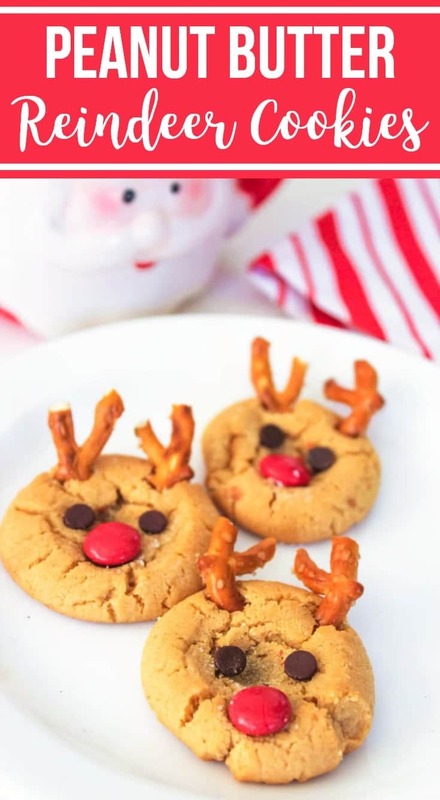 Make a batch or two of these adorable peanut butter reindeer cookies to share at your next Christmas party. Ho, ho, ho — can you feel the holiday spirit in the air!? 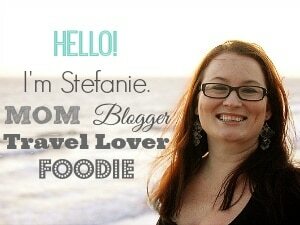 Christmas is quickly approaching and I am trying diligently to get everything in order before the last minute. Throughout the month of December, I have various holiday parties to attend, which means I will be baking dozens & dozens of cookies. I’ve got some great recipes already here on the blog, including M&M Christmas Cookies, Grinch Crinkle Cookies, Peppermint Kiss Cookies, and Oatmeal Craisin Cookies … but I noticed I didn’t have any holiday-themed cookies with peanut butter! A friend of mine sent me this recipe for peanut butter reindeer cookies and it was exactly what I was looking for! The added Rudolph red-nose decorations and pretzel antlers make this basic peanut butter cookie recipe POP — bringing a fun (and yummy!) delight to any holiday occasion. Happy Holidays! 2. Break pretzels into pieces to use as antlers. 3. 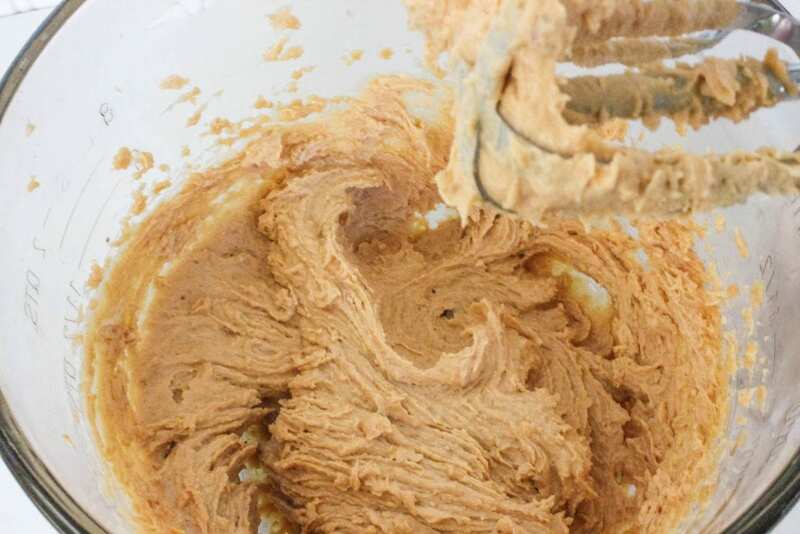 Cream together peanut butter, butter, sugar, and brown sugar until smooth. 4. Add egg and vanilla and beat until smooth. 5. 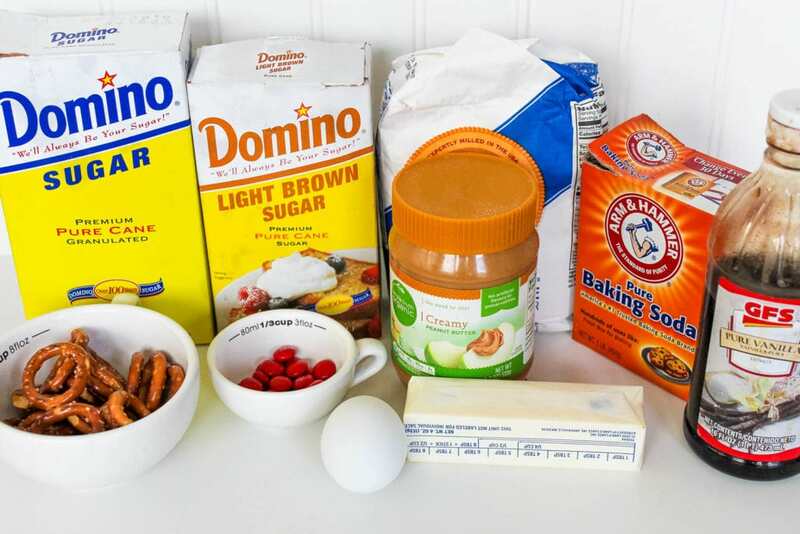 Whisk together flour, baking soda, and salt in a separate bowl. 6. Slowly add dry ingredients to the creamed mixture, beating until incorporated. 7. Roll into 1/2-3/4″ balls and place on cookie sheet several inches apart. 8. 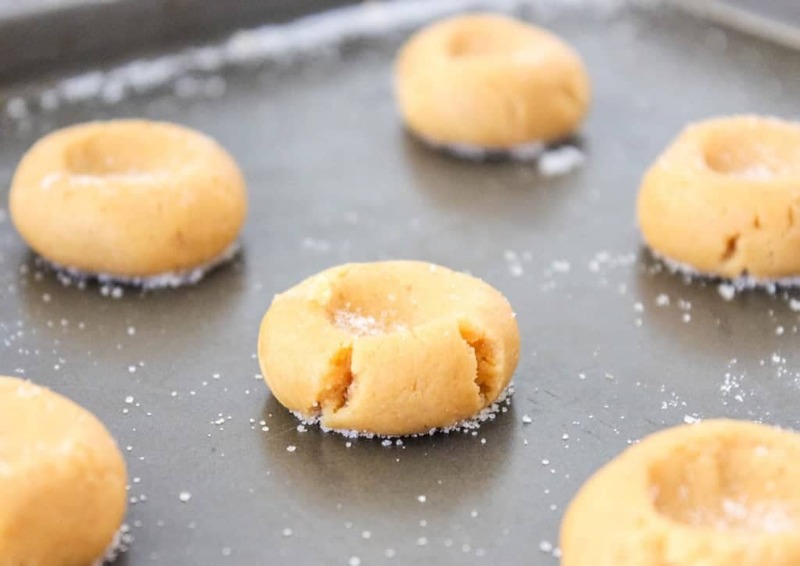 Sprinkle with sugar and gently make an indentation slightly off the center of each cookie. 10. Place an M&M’s in the indentation of each cookie. 11. Insert 2 mini chocolate chips (pointy side down) above the M&M’s to be the eyes. 12. Insert 2 pretzel pieces as antlers. Tip: If the antlers won’t stick, place some chocolate chips in a sandwich bag and microwave 30 seconds and knead until soft. Clip the very tip of the corner and pipe onto cookie to act as glue. Insert 2 pretzel pieces to resemble antlers. If the antlers won't stick, place some chocolate chips in a sandwich bag and microwave 30 seconds and knead until soft. Clip the very tip of the corner and pipe onto cookie to act as glue. Cookies are my all time favourite, and these peanut cookies seems of more taste because of the essence of pretzels.Thanks for the recipe. I am surely gonna try to make this.